PR/444 SER. BLK CRUISER 11"
PR/444 SER. BLK CRUISER 11.5"
PR/444 SER. BLK CRUISER 12"
PR/444 SER. BLK CRUISER 12.5"
PR/444 SER. BLK CRUISER 13"
PR/444 SER. 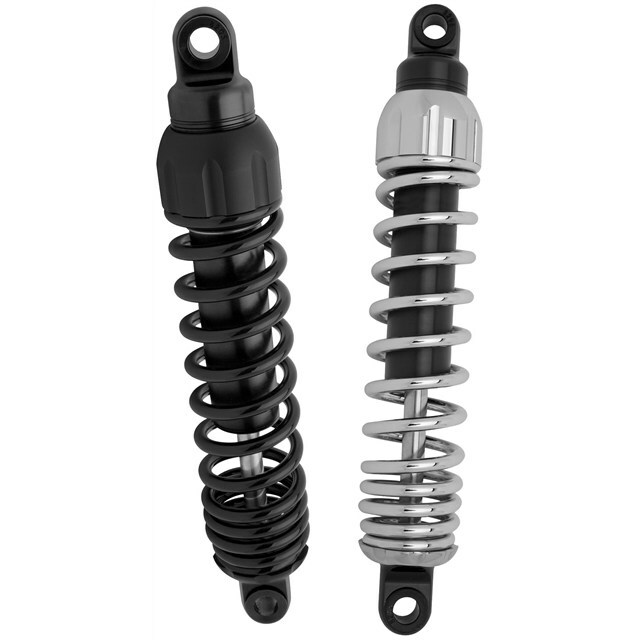 CRUISER CHR 11"
After more than a decade of ruling the roads with Progressive’s road proven 440 Series shocks, they’ve unveiled another breakthrough design. Dubbed Frequency Sensing Technology (FST) for its unique ability to dynamically adjust damping as you ride. The result is superior performance no matter the road conditions. A top mount threaded preload adjuster allows for fine tuning with a simple twist of the cap. Note: See Progressive® Suspension website for technical information and notes at www.progressivesuspension.com. Sold in pairs.